Wish to see the happy and exciting faces of your little ones? 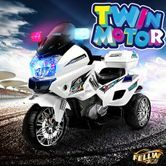 This Kids Motorcycle Electric Ride on Toy Police Motorbike w/ 3 Wheels - White can make your wish come true! Apart from the deluxe exterior design, this kids motorcycle also comes with a sounding horn, engine start-up sound, simple step control, hi/low speed and forward/reverse movement, which can surely offer your little biker a life-like driving experience. Featuring 50W motor with 12V battery, this toy motorbike can keep running for up to 2 hours after fully charged, guaranteeing a longer-lasting ride. Moreover, the adjustable speed from 4 to 7km/h enables your kids to choose the driving style they prefer. 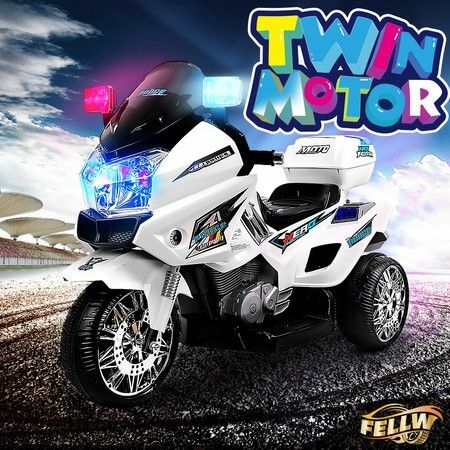 With anti-slip tyre and three-wheel design, this electric police motorbike also provides maximum safety and stability for your little ones while driving. In addition to the flashing light with 6 built-in songs, MP3 connectivity with volume control is available too, so that your little riders can enjoy their favorite music or tale while riding. If they want an outdoor trip, the large storage compartment in the back is pretty convenient to put some delicious food or other interesting toys. Suitable for kids from 3 to 8 years old, this kids ride on motorbike also includes a SAA approved battery charger with indicator light. What a perfect ride on car for your little ones! Purchase now and let their adventure begin with this appealing ride on motorcycle! Excellent purchase...kids loving it...battery is good..strong built..